Twenty years ago, the notion that Disney would have to relinquish the animation throne to a sophomore company with only a few unusual short films under its belt was inconceivable. In spite of its brief decline into mediocrity and financial decay, Disney had dominated the realm of animation since the 1930s and boasted a scintillating reputation as a corporation that could make dreams come true, both onscreen and in its lucrative parks. However, in 1995, Disney's vice-like grip on the industry was loosened by Pixar, a ragtag team of ambitious animators and storytellers that dazzled audiences with the first CGI-animated film, Toy Story. For the first time in history, Disney faced a truly worthy opponent (Don Bluth's films were popular, but never reached the same notoriety or monetary success as Disney's movies). By 2004, when it became glaringly apparent that Pixar had no shortage of creativity and funds to fuel its increasingly more popular features, Disney took it upon itself to start making CGI films. While its first few entries failed to dazzle (although Meet the Robinsons was a refreshing change of pace), Disney finally shattered the glass ceiling with Tangled. Though Disney would eventually adopt Pixar, the rat race continues now that Dreamworks and Laika are garnering praise for their ambitious productions. That insatiable urge to keep the throne is still present in Disney's recent releases, particularly Zootopia, which combines Pixar's creativity and world-building with Disney's optimism and endearing characters to make a phenomena that has taken the world by storm. The film opens with a young Judy Hopps (Ginnifer Goodwin), an optimistic bunny, performing in a history play, which quickly explains that prey and predator now live in harmony. She announces that she wants to become a police officer, which comes as a shock to her complacent farmer parents Stu (Don Lake) and Bonnie (Bonnie Hunt), who would rather she take up the family business. Though discouraged by her parents and the local fox bully Gideon Grey (Phil Johnston), Judy attends the Zootopia Police Academy and trains harder than any other student. Upon graduating valedictorian, Judy is assigned to Zootopia's Precinct One by Mayor Lionheart (JK Simmons) and Assistant Mayor Bellweather (Jenny Slate). There, she befriends the adorable dispatch officer Benjamin Clawhauser (Nate Torrence), but alienates her superior Chief Bogo (Idris Elba), who assigns her to parking duty. While on the job, Judy meets and is tricked by local con artist Nick Wilde (Jason Bateman), a sly red fox. Though she is annoyed by his sarcasm and pessimistic nature, Judy is forced to recruit Nick's help when she is given only forty-eight hours to solve a missing animal case. This seemingly innocuous case, however, sends Judy and Nick down a rabbit hole of lies, prejudices, and mysteries. This is an unusual Disney film to say the very least. Though the presence of anthropomorphic animals is classic Disney, there is nothing gimmicky about their floppy ears or swishy tails. Instead of using animal characters as bait for younger audiences, the movie cleverly uses the divide between prey and predator as a metaphor for social and racial differences in the real world. The city of Zootopia presents itself as a perfect monument to advanced society, partitioned into districts that service the needs of both prey and predator. However, like most utopias, this sprawling world is home to internal tensions and the same issues that plague most human cities, including racism, tokenism, and possibly sexism. 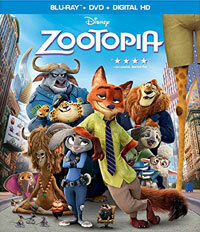 There is no shortage of inspired depictions of racial micro-aggressions using animal characters (Nick touching a sheep's wool without permission mirrors white people touching black women's hair; Judy informs Clawhauser that a bunny can call another bunny "cute", but it is inappropriate for other animals to use the term). These additions to the film are staggering in their tactful presentation of very real social problems, which I hope will teach children how to respect one another regardless of race and value requests made by certain ethnic groups. Zootopia has received critical acclaim for its sophisticated handling of these themes and it definitely deserves it: Disney has taken a hot-button issue and incorporated it into an intelligent story that has no qualms about emphasizing the dangers of discrimination. In addition to exploring mature themes, the film also strays from the typical genres of child fare. It abandons comedy and fantasy for film noir and buddy cop banter, which is an unusual move on Disney's part. While Frozen was far from a laugh riot, it was ostensibly a fantasy and a musical--signature Disney. Big Hero 6, though occasionally morbid, was a fun sci-fi romp with marketable characters. Zootopia, on the other hand, isn't very funny, nor is it ever grounded in anything but reality. It is, first and foremost, a mystery with a huge dose of moral rectitude. However, it doesn't mean that Zootopia isn't any fun. In spite of being light on laughs, the sight gags are great and the repartee between Nick and Judy is intrinsically funny thanks to Bateman's sarcastic drawl and Goodwin's effervescence. Their relationship is refreshingly platonic, but they still have a strong, magnetic dynamic that keeps the plot in motion whenever the story dawdles. The animation is spellbinding; the character designs are cute and exquisitely detailed, from the subtle twitches of Judy's nose to the condescending quirk of Nick's eyebrows. The animation throne may be hotly contested, but it seems like Disney is still keeping a grip on its title. As Pixar's efforts become increasingly mediocre (seriously, who green-lit The Good Dinosaur? ), Disney's CGI releases just get better and better. Though Zootopia doesn't quite match the elegance and hilarity of Pixar's early movies, it is an engaging, thought-provoking, and ultimately important film that teaches its audience members--both young and old--that change starts with them. And in a world in need of change, that's a message. Zootopia gets extra credit for having the animals be to scale on Blu-ray Disc courtesy of Walt Disney Studios Home Entertainment. The film has been letterboxed 2.35:1 and the Disc contains an AVC 1080p HD transfer which runs at an average of 25 Mbps. The image is incredibly sharp and clear, showing no grain and no defects from the source materials. The colors look incredible, as the film displays a fantastic rainbow of tones, and the image is never overly dark or bright. The depth, even in this 2D version, is impressive and to call the visuals immersive would be an understatement. The level of detail is also wonderful, as we can make out various layers of animation. The Disc carries a DTS-HD Master Audio 7.1 track which runs at 48 kHz and an average of 5.0 Mbps. The track provides clear dialogue and sound effects. While it could be argued that the track could have more "oomph! ", we do get an abundance of stereo and surround effects during the action sequences. These effects are nicely detailed and show off the care which went into the mix. The subwoofer effects punctuate the action and offer a mild amount of rumble. The Zootopia Blu-ray Disc contains several extra features. "Research: A True-Life Adventure" (10 minutes) shows how the filmmakers observed real-life animals before they even completed the script in order to learn their behavior and distinctions. This included a trip to Africa. In "The Origin of an Animal Tale" (9 minutes), the creative team describes the various ideas which were pitched and explored on the way to creating Zootopia. This includes a great deal of character sketches, and some test footage. "Zoology: The Roundtables" (18 minutes) is a three-part series in which various members of the production team discuss the "Characters", the "Environments", and the "Animation". Composer Michael Giacchino comments on the film's music in "Scoretopia" (5 minutes), which also contains participation from John Lasseter, and footage of the musicians at work. "Z.P.D. Forensic Files" (3 minutes) shows us some of the Easter Eggs hidden in the film. "Deleted Characters" (3 minutes) offers sketches and low-tech animatics for six animals who didn't make it into the movie. The Disc contains seven DELETED SCENES which, when played with the introductions, run about 28 minutes. Most of these are done in animatics. The final extra is the MUSIC VIDEO for the song "Try Anything" by Shakira.